Isoftbet’s quirky fishing-themed slot, Get a Fish, complete with the authentic sounds of nature, is probably the closest thing to being by the river, but online slot developer Microgaming give it a run for their money with their fishy escapade, the 5 reel Alaskan Fishing. Play your slots right, however, and it’ll be more than five ‘reels’ you’ll be seeing as you take down the big prizes hook, line and sinker. Taking a trip into the wild, Alaskan Fishing sees you pitching up on a salmon fishing trip in the wide open spaces of the North, with just the stunning landscape, some hungry bears, and a grating country soundtrack for company. And if the breezy John Denver-esque music doesn’t put you in the mood - or indeed, put you off altogether - then the pretty graphics will. Perfectly-rendered grizzly bears chowing down on a nice salmon, fishing boats, tackle boxes, soaring bi-planes and swooping eagles all add to the feel of the (fishing) reels. 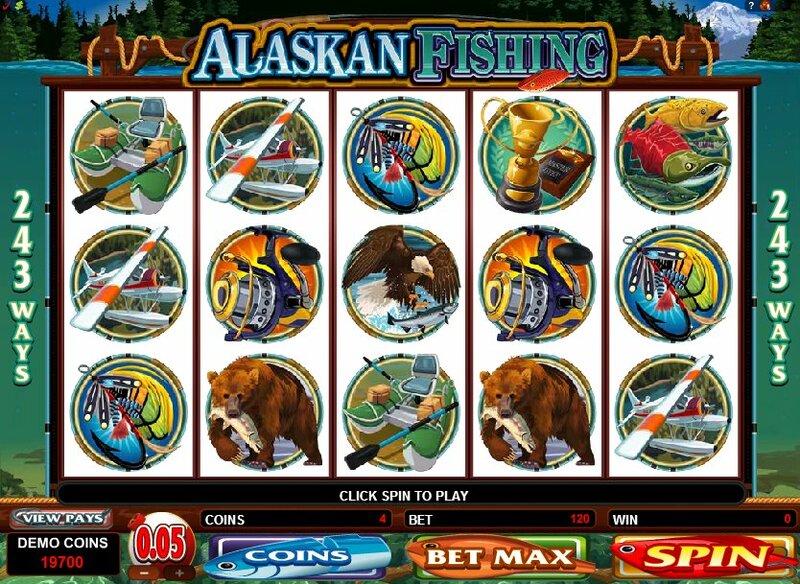 As with other Microgaming slots like their geisha-themed slot Asian Beauty or their gothic-themed game Immortal Romance, Alaskan Fishing eschews the usual betting lines and goes for the 243 different ways to win system. The bigger betting pattern means more coins to win: 5,000 in the basic game, 10,000 during the free spins round, and over 20,000 in the bonus feature. Amidst all the pretty graphics, look out for the Alaskan Fishing logo as it acts as the Wild, the symbol substituting for all the other ones other than the scatter. The tackle box is the scatter, meanwhile, and hooking 3, 4 or 5 of them anywhere will trigger the free spins round. 15 free spins are up for grabs (which can be doubled) and there’s a bonus scatter on offer too. The smiling fisherman symbol on the 1st and 5th reel triggers the Fly Fishing Bonus Game. It’s ‘pick the best 5 from 9’ territory here, as you might recognise from other slots with bonus games. In this case hooking the five best fishing holes from the nine on offer gets you a multiplier on your stake, anything up to a 15x multiplier. 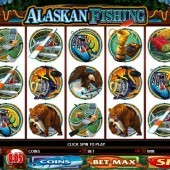 If you like some nice chilled thrills in your slots, then Alaskan Fishing ticks all the boxes: nice graphics, breezy music and good chances to win some big cash. There are some nice little animated touches, as you’d expect from Microgaming, and with that, I’m off to pick my spot by the river and dream up a few more bad ‘reel’ puns.